Did you ever wonder why your shower curtain has soap scum stains all over it and nothing you do seems to stop it? Are you always seeing spots on your dishes no matter what detergent you use? If so, you probably have a hard water problem. Our Fremont plumbing crew is here to explain what causes it and what to do about it. When water is in the ground, it picks up any water soluble materials that it passes through. Calcium and magnesium are just some of the many minerals that may be present in your water, but they are the ones that cause all kinds of problems in our homes. These two minerals are the cause of that slimy residue and those hard water spots on your dishes. When calcium and magnesium are present in water, they prevent soap from being fully dissolved. Instead, it becomes a curd-like substance. This means more soap is required to do a thorough cleaning job. Maybe you've noticed that your laundry is stiff and still a bit dirty, even after several washes. This could also be soap curd remaining in your clothes. The curd is not soluble, so it won't dissolve and get carried away.This soap scum builds up on the surfaces of all the areas where it is used. This means your bathtub, your sink and the interior of your washing machine and dishwasher will probably end up with a layer of clear slime or film on then after a while. This is not the terrible part, though. When calcium and magnesium begin to build up in your water system, they precipitate from the water and start to form build-ups on the interior of the pipes. This reduces water flow and can increase water pressure. This is extremely bad in the case of storage style water heaters. The minerals build up on the heating element on electric models or near the bottom of the tank in gas models and create scale that drastically reduces the efficiency and lifespan of the unit. This is why areas with hard water problems have water softeners. 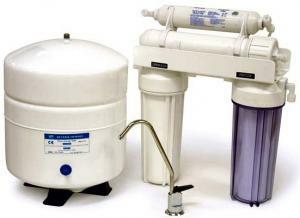 Water softeners remove the calcium and magnesium from the water and replace it with sodium which doesn't have any of the downsides of the other two. This is how it works. 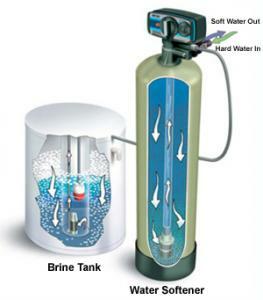 The water softener is actually comprised of two tanks, a water softener tank and a brine tank. The softener tank is filled with plastic beads that have a negative charge. Because calcium and magnesium are both positively charged, these minerals are attracted to the beads and drawn out of the water. The water is then sent to the brine tank where the positively charged water comes in contact with the negatively charge sodium (salt). The sodium takes the place of the magnesium and calcium, and the water is returned to the softener tank to be sent out into the home. If you have been seeing this type of problem in your home, it's probably time to have a water softener system installed. The results will be noticed immediately. Call our Fremont plumbing crew and get yours installed today!